Women constantly have to worry about weight issues. How many times have you heard men discussing about their weight problems? The world’s general conception of a perfect figure, ideal weight, right curves in the right places for women is colossal. Men seem to just lead a happy, eat all you can sort of life without any issues. Not saying that there are no obese men, there are many with this fast pace and fast food era that we are living in. I’ve battled with weight issues ever since I delivered my twins. Have not managed to get back to my ideal weight. Being a food blogger really doesn’t help, but I’ve been through all the programs and diets that most women try out… moong dal diet, salads and soups only, detox diets, yoga, fast walking, gyming, cross trainers, treadmills, calorie counting etc etc. However, one thing that I lack is consistence as I get bored with a fixed routine very easily. Now that I’m in my 50s, I just cannot be bothered with all these fad diets, zumba, hot yoga, trampoline, circuit training etc. I’ve got to think about my creaking knees. So now I just stick to making healthy choices and exercising regularly (preferably walking). The exercise part I still have to be more disciplined. My healthy choices are no sodas, no packet juices, no to bowlful of fried snacks, reducing carbs in my meals,can’t remember when I last had store bought cookies. So yes, slowly getting there. Salads are a part of my daily diet. I try to have salads only for either dinner or lunch. I rarely will have a basic salad of tomatoes, cucumber and onion on my table.That’s an absolute emergency solution. Most of salads I prepare are wholesome, healthy, filling and colourful. When #FoodieMonday#Bloghop decided on #Salads as our 55th theme, I was more than happy. With my daughter visiting us and on a pre-wedding fitness program, salads are prepared everyday. For this week’s salad theme, I decided to make a burrito bowl salad. Burrito bowls normally have rice as the base and usually have re fried beans as one of the options. Burrito bowls are so versatile as one can choose to add anything right from avocados to meat. To make it into a healthy but filling burrito bowl salad, I used quinoa as my base. The few tortilla chips served with the salad, takes care of the desire or urge to have a crunchy munchy snack. Quinoa(keen-wah) is gluten free and one of the very few plants that are rich in protein and contains all nine amino acids. It actually is a seed and not a grain or cereal. Quinoa was mostly consumed in South America and became a superfood just a few years ago. Its rich in fiber and has low glycemic index which means its good to control blood sugar. Quinoa is rich in essential minerals like magnesium, potassium, zinc, iron etc. Here’s my healthy and filling burrito bowl salad. Wash the quinoa in a sieve or strainer. Put 1 cup water in a saucepan over medium heat. Add the washed quinoa and salt. Bring it to a boil. Lower the heat so that the quinoa simmers. Cover and cook for 5- 7 minutes or till the water evaporates. Remove the quinoa from the saucepan and put it into a bowl. Separate the grains using a fork. Let it cool down. Peel and slice the avocado. Drizzle some lemon over it so that it does not turn dark. Cut the cherry tomatoes into half if you using them. Before you assemble the bowls, divide all the ingredients except the guacamole and salsa into 4. Put the quinoa at the the bottom. Then arrange the tomatoes, beans, corn, pepper, avocado, lettuce over the quinoa. Sprinkle chopped spring onion and cheddar over the arranged salad. 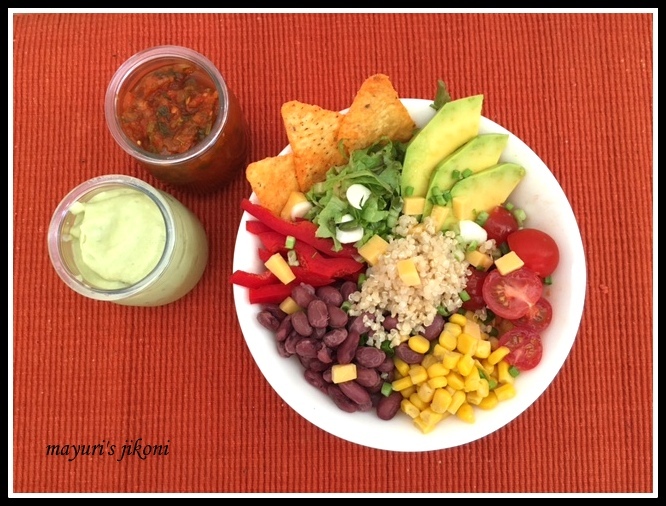 Serve the burrito bowl salad with salsa, guacamole and tortilla chips on the side. Add cucumber, red onions, steamed broccoli, sauted mushrooms if you like. Add fresh coriander(cilantro) if you like. Use lettuce leaves of your choice. If you don’t get lettuce leaves, use shredded cabbage. What a colourful salad platter Di! Wish I could grab the plate right out of the picture and enjoy with the dips. Such a colourful and healthy bowl of salad .. looks so inviting. I love avocado. What a colourful treat. Salad looks so inviting Mayuri. Loved the write up too. Loved the addition of quinoa . Such a colourful salad and a lovely write up di.